I started my day in one of the nicest ways I know how: listening to a BBC radio dramatization of Anthony Trollope’s The American Senator. Trollope adapts so well for film and radio, provided he is left in the right hands (the recent adaptation of Doctor Thorne has not yet aired in North America but I gather I should be very alarmed indeed). The American Senator was the very first Trollope novel I read and made me into a life-long Trollope fan, so it will always hold a special place in my heart. And then, after happily listening to the first episode, I saw that today is the anniversary of Trollope’s birth. A very nice coincidence and proof positive that his legacy endures. 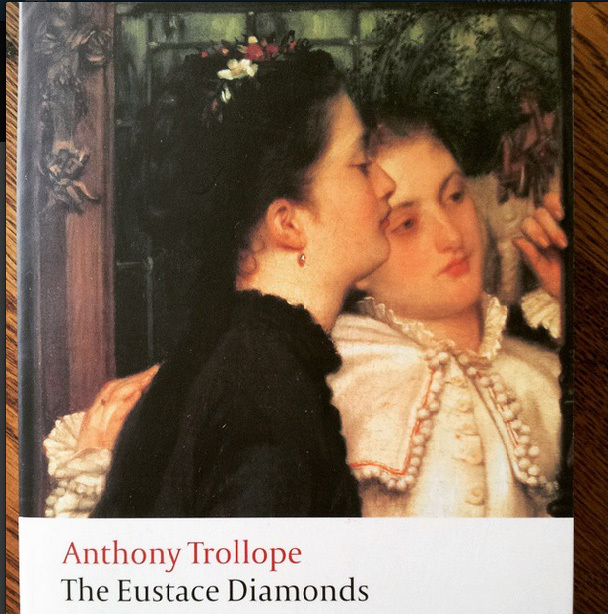 More than two hundred years after his birth, Anthony Trollope is in no danger of being forgotten and his stories delight readers as much as ever. A lovely, gently-paced novel about love, aging, and music. I read this historical children’s novel (the first in Welch’s Carey series, currently being reissued by Slightly Foxed) back in January and was so impressed I haven’t stopped thinking about it since. Welch’s thoughtful character development and rich historical details compliment a rip roaring plot to delight readers of any age. A breezy, charming memoir about Fraser’s early years. I adored this biography of Origo, famous for her wartime diary (War in Val d’Orcia – which I’ve yet to read) and her garden at La Foce (which I’ve yet to see). Moorehead does an incredible job of describing the richly complicated Florentine expat community Origio grew up in and her extraordinarily varied circle of acquaintances, as well as her personal achievements. There was nothing simple or straightforward about Origio and Moorehead does full justice to her subject’s complex life. When I visited the Val d’Orcia region of Tuscany in September, I was delighted to see for myself the landscapes Moorehead had described and which Origio knew so well. An entirely unique comedy about the romantic and spiritual plights (often entwined) of a young British Muslim feminist. It remains the only book that kept me up reading long past my bedtime this year and had me giggling even more often than Bill Bryson’s The Road to Little Dribbling. An unusual choice for this list but this is easily the book I’ve spent the most time with this year. And what a book it is. Hazan’s precise recipes are a joy to read and a delight to recreate. Since buying this in Portland last February, I don’t think more than a week or two has gone by without me trying a new recipe from it. I am devoted to the soup chapter, in thrall to the pasta sauces, and had a revelation over brisket when I made the beef roast with braised onions. It has quickly become my most cherished cookbook. A thrilling historical novel with two equally thoughtful, appealing heroines. Glendinning’s thorough, affectionate, and very readable biography of Trollope gave me a new appreciation for the books of his I’ve already read and more impetus to read the others. I was especially fascinated by her interest in his relationships with the women in his lives and how they influenced his female characters. A funny, poignant, generous novel to end Trollope’s extraordinary Barsetshire series. 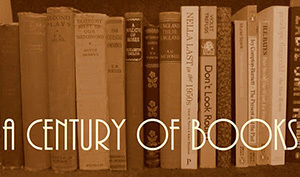 An enchanting collection of letters spanning almost fifty years. STW was a wonderful correspondent, filling her letters with richly-detailed annecdotes, self-deprecating humour, and the most delightful flights of whimsy. I’ve yet to read a single one of her novels but, after reading this and the wonderful collection of her letters to William Maxwell (my favourite book of 2012), I can’t help but think of her as a close, dear friend. Saying goodbye is difficult. When I finished The Last Chronicle of Barset by Anthony Trollope (four years after picking up The Warden, the first in Trollope’s delightful series), it was with tears streaming down my face and the sense that I was parting from dear old friends. But the beautiful thing about books is that I can always revisit these friends, as long as they remain on my shelves (which they will do – forever). Much has changed since we were first introduced to the cathedral town of Barchester in The Warden. Children have grown to adulthood (or been wordlessly killed off, in the case of two of the Grantly offspring), ecumenical battles have been waged, marriages both good and bad have been made, and, as is only natural with the passing of time, our beloved central characters have aged. Mr Harding, surely the sweetest and most beloved of all Trollope’s creations, is slowly begininning to drift out of this life. The Grantlys are rejoicing in the worldly success of their children, though youngest son Henry, now a widower, is less certain of his path than his siblings. In Allington, Lily Dale, still in her early twenties, is settling down to a life of pleasant spinsterhood while in London Johnny Eames is progressing steadily at work and, when he’s not too busy, still pining after Lily. And, at the bishop’s palace, a quiet revolution is being to take shape. At the heart of the story is the very Trollope-esque mystery of Mr Crawley and the stolen cheque. Mr Crawley, the morally uptight and perpetually cheerless perpetual curate of Hogglestock, stands accussed of stealing a cheque. Never a particularly attentive man, he can’t adequately explain how the cheque came to be in his possession. He thought it came from Dean Arabin, but Arabin thought not. Already poor and relatively friendless, Crawley settles in to enjoy his martyrdom and alienate those friends who do try to assist him in his time of need. And those friends are legion, though they are in truth really the friends of his long-suffering wife and eldest daughter, Grace. The Luftons and the Robarts at Framley try to help, as do Lily and Mrs Dale, and various Grantlys – particularly Henry, who is in love with Grace Crawley. But Crawley is a stubborn man and is determined to suffer until his innocence is proved. Meanwhile, he goes a little mad. With such a father, I can forgive a great deal in Grace Crawley. She is perhaps the dullest Trollope heroines I’ve yet to come across – certainly the dullest in this series. She is so sweet and good and morally upright that she refuses to marry the man she loves, Henry Grantly, as long as her father stands accused. Her reasoning is peculiarly Victorian: she will not taint her love and his illustrious family with her father’s shame. And, of course, she is beautiful and graceful and a true lady, etc, etc. When the archdeacon finally meets Grace, he quite falls in love with her and is moved to tears by her plight (a situation easily foreseen by Mrs Grantly, who knows her husband’s sentimental heart). A fine pair. I can’t bring myself to like Grace. Trollope’s other heroines are equally good and moral but they have a bit more fun and fight in them. Grace is a sad creature with no discernable sense of humour. She’ll make Henry Grantly a lovely wife but a dull one – which is fine as he seems quite dull too, as do his two surviving siblings. None of the archdeacon’s passion or Mrs Grantly’s well-concealed cunning seem to have been passed down to the next generation. As they are two of my favourite characters – indeed, the archdeacon is probably my favourite of all Barsetshire residents – this is a sad thing indeed. My old friend John was certainly no hero – was very unheroic in many phases of his life; but then, if all the girls are to wait for heroes, I fear that the difficulties in way of matrimonial arrangmenets, great as they are at present, will be very seriously enhanced. Johnny was not ecstatic, nor heroic, nor transcendental, nor very beautiful in his manliness; he was not a man to break his heart for love or to have his story written in an epic; but he was an affectionate, kindly, honest young man; and I think most girls might have done worse than take him. Much as I love Johnny, I can’t think he would make Lily a good – or constant – husband. He is always falling prey to some artful female, always too happy to neglect his duties, always, in short, thinking of himself and the present moment. No, as a husband for Lily he will not do and so the author sentences them both to eternal singledom. Something I suspect they will both excel at. They are friendly, selfish creatures, much loved by others. They shall never lack for friends and never need to think of anyone else. With his own mother and sister, John Eames was in these days quite a hero. He was a hero with them now, because in his early boyish days there had been so little about him that was heroic. He has worked his way up in the world, inherited a little money, and made a few more influential friends. He has a gift for making friends and, by instantly and carelessly sharing his heart and innermost thoughts with them, turning them into his devoted supporters. Those who know him a little better would wish him to work harder and with less complaints – both in matters of commerce and the heart. He shares his feelings and his dreams with everyone he meets – endearing, no doubt, but concerning if you are Lily Dale and constantly being petitioned on his behalf by near strangers. He still keeps less respectable company in town, with no true friends to reign him in and steer him in less dangerous directions (though Conway Dalrymple tries). Trollope, better than almost any writer I’ve found, understands how lonely and scary it is to be in your twenties and starting a career, hating the dull, grinding work, wanting to move up but not really wanting to expend the necessary effort. Any distraction is welcome and any chance to be heroic should be seized. God bless Johnny Eames for seizing what adventures come his way. There are two major deaths in The Last Chronicle of Barset: the entirely expected passing of Mr Harding, after a long and satisfying life, and the unexpected death of Mrs Proudie, the bishop’s reviled wife. Mrs Proudie’s death comes as a shocking blow to her husband, who had only just begin tto assert himself after decades under the rule of that virago. Dr Proudie has always been a pitiable character but never moreso than here. I cried less for Mr Harding – so certain that he is going to his reward – than for the archdeacon. They never truly understood one another but they were family, friends and allies for so many years. My dear archdeacon will miss him. In the end, this was not my favourite Barsetshire book; The Small House at Allington retains that honour. A dull romance and over-long plot about the stolen cheque detracted from the really excellent elements: the return of Lily Dale and Johnny Eames, the archdeacon’s emotional outbursts over any number of things, and the beautifully touching depiction of Mr Harding’s final days. Yes, not the best book in the series but still a wonderful conclusion to an absolutely absorbing saga. Today marks 200 years since Anthony Trollope was born. Trollope has been a relatively recent discovery for me (I only started reading him back in 2011) but he has quickly become one of my very favourite authors – so much so that I am currently reading two fabulous Trollope-related books: his wonderful novel The Eustace Diamonds and Victoria Glendinning’s excellent biography of him. 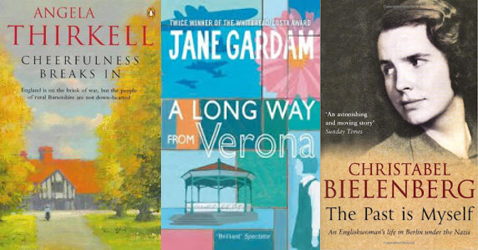 I’ve enjoyed all of these (plus The Three Clerks, which I read but never managed to review) and look forward to reading and rereading many more of Trollope’s books in years to come! Almost before I knew who Anthony Trollope was, I was being warned by other readers of how disappointing I would find The Small House at Allington. Lily Dale was a drip, I was told, and the entire book a drag to read. Old visitors to Barsetshire happily skip it when rereading the series. Forewarned, I put off reading the novel for months after finishing Framley Parsonage. But then I went into Trollope withdrawal and, rather than turning to one of the standalone novels, decided to soldier on in Barsetshire. I picked up The Small House at Allington with no great expectations. I put it down a few days later convinced that it was the best Trollope I’ve read yet. 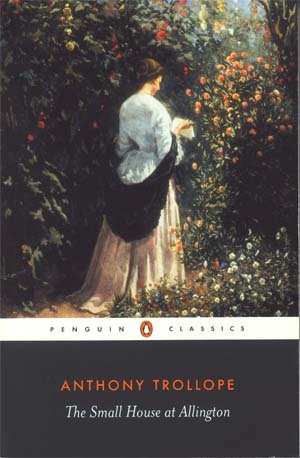 Even people who have never read Trollope themselves are familiar with Lily Dale, the jilted heroine of The Small House at Allington, whose constancy to her former fiancé so appealed to Victorian readers and so enrages modern ones. Lily lives with her mother and elder sister at the Small House at Allington (as opposed to the Large House, inhabited by her uncle, Squire Dale). In the novel’s early chapters, she meets and falls in love with Aldolphus Crosbie, a winsome and ambitious young man. Unfortunately, shortly after their engagement Crosbie abandons Lily to make a socially advantageous marriage to Lady Alexandrina de Courcy, the eldest daughter of a well known and unpleasant family familiar from earlier Barsetshire books. Meanwhile, young Johnny Eames, a friend of Lily’s since childhood, longs to avenge the wrong that was done to her by Crosbie and to win her for himself…if only he could get his rather messy London life sorted out first. I can see why modern readers find Lily enraging and also why Victorian readers adored her. She is affectionate and resilient but, when it matters, introverted to the extent that neither the reader nor her own family can really know what is going on in her mind or heart. Trollope later referred to her as a “prig” but the Lily he presents here, obstinate as she is, seems too bold to be branded with such a milksop label. She teases that she is a domestic tyrant and throughout the book goes along, doing just as she likes, happily ignoring the well-meant and generally sensible advice of those who love her. When she is abandoned by Crosbie, Lily does not go immediately into a decline; she has no delicate feminine constitution that collapses under the emotional strain of her broken engagement. She soldiers on, laughing and teasing, taking joy in others’ happiness. But you never quite know what is going on in her head. Her lighthearted flirtation and sharp banter seem at odds with the devotion she shows to Crosbie. I think I like her and yet I am not quite sure. I am certainly fascinated by her. Poor Aldolphus Crosbie is perhaps the most interesting and, in many ways, the most sympathetic character. The reader – and Lily – knows from the start that he is young, full of more flash than substance, more ambition than moral certainty. But it is his half-formed character that makes him so sympathetic. He is a man with no cruelty in him, no badness, just weakness. And he is more than punished for his youthful foolishness by his marriage to Lady Alexandrina – and into the heartless de Courcy family. He tasted enough true intimacy and affection with Lily to know what he is missing. His about-face so shortly after becoming engaged to Lily is upsetting but wonderfully written. He is being true to himself, if not to Lily; one of the first things Trollope shared about Crosbie was his acknowledgement that “he could not marry without money; and he would not marry for money.” Foolishly, it is only after becoming engaged to Lily that he sets out to discover if her uncle, the squire, intends to settle any money on her. He, a childless bachelor who one would expect to do better (and who does indeed reconsider his position over the course of the novel), refuses to give Crosbie the assurance that she will receive any money on her marriage. With the prospect of trying to support a wife on only his meager salary, Crosbie sets out on the fateful trip to Courcy castle where, with the thirty-something – but dowered and well-connected – Lady Alexandrina on display, ambition wins out over affection. This is a thick novel and over the rest of it Crosbie has much time to repent of his decision. His arrogance and confidence, his dreams of a bright professional future, are slowly ground down as the frightful and demanding de Courcys invade every corner of his life. Meanwhile, his timid would-have-been-rival for Lily’s affections, Johnny Eames, finds himself rising in the world. Johnny works moderately hard at his job but, more importantly, finds himself with a well-connected patron, Lord de Guest, whom he saved from a charging bull in a delightfully comic scene. Lord de Guest helps champion Johnny’s bid for Lily’s hand but it is of no use: Lily has no interest in any other man than Crosbie, feeling herself bound to him despite the abrupt end to their relationship. I feel like I ought to have liked Johnny Eames more than I did. He is appealingly green and insecure, the sort of young man who Trollope excelled at writing about sympathetically. But, in his way, he is crueller to the women in his life than Crosbie was to Lily. The scenes in Johnny’s squalid London boarding house make it that much easier to understand the appeal of gently-bred Lily but that does not make his treatment of Amelia Roper, the landlady’s daughter to whom he declared his half-hearted love, acceptable. What I did love about Johnny Eames – and Crosbie – were the details of their working lives in London. I adore Trollope for many reasons and one of them is the insight he gives into the professional careers of middle-class Victorians. I delight in learning about the sort of hours clerks worked, or the amounts they were paid, or what they did on their weekends, or how they furnished their houses and how they managed to afford to marry and support children. And I adore reading about office politics and the hierarchies within the departments where Trollope’s characters work. The Three Clerks was a perfect book for this but The Small House at Allington, which spends a significant portion focused on Crosbie and Eames, is almost as good. Young men, very young men – men so young that it may be almost a question whether or no they have as yet reached their manhood – are more inclined to be earnest and thoughtful when alone than they ever are when with others, even though those others be their elders. I fancy that, as we grow old ourselves, we are apt to forget that it was so with us; and, forgetting it, we do not believe that it is so with our children. I feel like every Trollope book has at least one of these timeless reminders that is wildly appropriate for my life at that moment. I often find myself copying them out and forwarding them on to friends or family members. 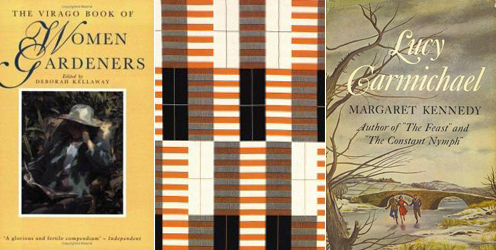 The genius of The Small House at Allington, where it rises about the rest of the equally entertaining Barsetshire books, is that it is perfectly put together. The plotting is tight, the characters compelling (if not always comprehensible), and there are none of the extraneous scenes or storylines that distract from the action in his other novels. That’s not to say that there aren’t secondary storylines: there are several. While Lily is pledging herself to eternal maidenhood, her sister Bell is confusedly falling in love with the village doctor. And in a more exalted strata of society, the awkward and shy Plantagenet Palliser is falling inappropriately in love with the exquisite Lady Dumbello, to the horror of both their families. This sets up the Palliser books nicely and makes me eager to start them, but not before I finished with Barsetshire. The Last Chronicle of Barset awaits.